Sleek muscular physique. Dynamic aquatic killer. Mysterious enigmatic loner. You can see why otters shared the cinema box office with James Bond in the Sixties and Seventies. Otters are natural film stars, the Sean Connery of British mammals (with a slightly hairier chest). The return of the celluloid heroes. I remember two otter-based films from my childhood. I caught ‘Tarka the Otter’ at the local Odeon and the superior ‘Ring of Bright Water’ always won over ‘Goldfinger’ on the TV at Christmas. From the opening man-meets-otter sequence (both the greatest and silliest scene ever committed to celluloid) through to Val Doonican’s closing credits crooning - it’s a classic! But behind the otter’s silver-screen celebrity status lies a darker, sadder tale. Wild otters in Britain were in trouble. Throughout most of the last century our rivers and wetland habitats were in a shocking state – polluted, drained and destroyed. Otters were forced into exile in the far flung corners of Britain. The last Sussex otters struggled on until the 1960s. And with our heroes out of the picture the bad guys muscled in. American mink, which escaped or were ‘liberated’ from fur farms, rose to the top of the food chain and terrorised our waterways. These voracious predators attacked our native wetland wildlife, wiping out entire populations of water voles across Sussex. But this screenplay has a happy ending. Over the past decades we’ve cleaned up our act and a lot of work has been undertaken to improve rivers and wetlands in Sussex. 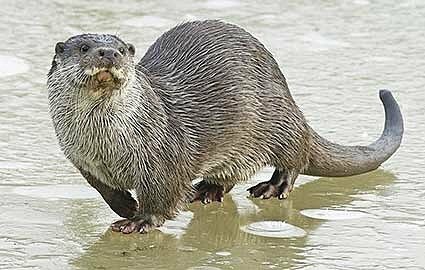 Otters are wandering, territorial animals – each otter needs 40 km of river to make its home - but projects undertaken by conservation groups such as Sussex Wildlife Trust working with local landowners have provided these connected, wetland habitats. And what is good for the otter is good for us too. By undertaking wetland habitat improvements for wildlife - such as planting floodplain woodland or creating water meadows - our countryside regains its powers as water purifier, erosion controller and flood regulator. Over the past years footprints, droppings and fleeting glimpses have given tantalising evidence that these mammalian movie stars are attempting a comeback in Sussex after half a century. Recently, night vision trail cameras were rolling and filmed a female otter as she made her Sussex small screen debut - possibly the first time a wild otter has ever been filmed in our county. But the real showstopper came when these cameras later captured footage of one - or possibly two - otter cubs; evidence that otters are breeding again in Sussex. With this dramatic plot twist there is plenty of potential for a sequel. The dream that one day we could see these incredible animals swimming in all the restored and vibrant rivers of Sussex is a step closer to becoming a reality. By Michael Blencowe: Learning & Engagement Officer, Sussex Wildlife Trust. Sussex Wildlife Trust is an independent registered charity caring for wildlife and habitats throughout Sussex. Founded in 1961, we have worked with local people for over half a century to make Sussex richer in wildlife. We rely on the support of our members to help protect our rich natural heritage. Please consider supporting our work. As a member you will be invited to join Michael Blencowe on our regular wildlife walks and also enjoy free events, discounts on wildlife courses, Wildlife magazine and our guide book, Discovering Wildlife in Sussex. It’s easy to join online at www.sussexwildlifetrust.org.uk/join or T: 01273 497532.